They were sponsored by Clifton Rotary Club. 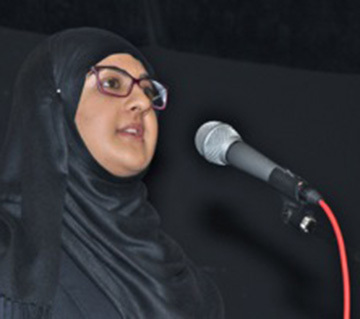 Our picture shows one of the winning team, a young person named Mariam Rana-Javed. We congratulate her and the them on their win and would also thank the clubs who sponsored teams in both the intermediate and senior competitions. Just 2 weeks before that we had the district finals of Young Chef at Cotswold School, Bourton on the Water. As we write Cheltenham Sunrise are ramping up their Young Musician competition. We have also made awards to Young Writers and Young Photographer. It would be great to have the top entries on the District Website along with the names of the winners. It's awful, the weather: keep warm and dry. I hope you are all warm and dry in this awful weather. The floods are awful and I know we are all very sorry for those affected by them. Last week D1200 appealed for help with the problems in the Somerset Levels, I sent the contact address out to your presidents. This week we have floods in own district in Worcester in Tewkesbury and members have been asking what we are doing about it. I have taken advice and think that if we wish to help we contribute to the RIBI Flood appeal and if we know of hardship we can apply to this fund. Should things change or get worse or we can help more directly then I will of course inform you. Last Monday I was invited by the District e Club to present the Charter and Presidents Jewel to Uplands School in Swindon. This was a very special day for the school with presentations from the headmistress Jackie Smith(a Rotariam member of the District1100 e Club) the local MP, but most importantly from the children , we also heard a selection of songs from the choir. A truly remarkable school where children who are differently abled are getting the best education possible. If you haven't got round to it yet you can still register for conference, forms can be downloaded from the district website (only 5 weeks away now, doesn't seem possible. How time does fly. The picture above is from an article in The Wire about polio. It gives a first hand account by a journalist and aid worker. 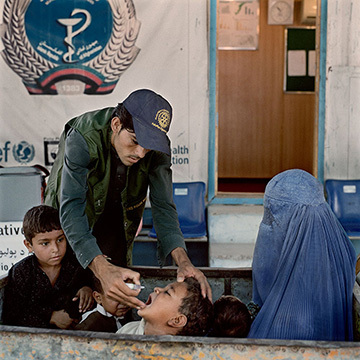 The picture shows a male aid worker administering vaccine in Afghanistan. Male aid workers are not allowed into the house but give the immunisation outside. The interact Club at Uplands School Swindon are taking part in "The World's Greatest Meal to Help End Polio". They have cooked up quite a treat. From Swindon Advertiser. The campaign launched on Facebook had reached an audience of over 60.000 this week alone. The year long advertising campaign has been very successful with membership enquiries increasing fourfold. The concern is that we are not always turning the prospects into members. The time, effort and money spent at the front end is not being turned into members at the back end. Many of us would like to know why that is and what we need to do to help you rectify that. Katie Cooper and Jane Jenkins Bristol. We offer you a warm welcome into Rotary and we wish you good service and great fun. Cheltenham Sunrise are joining with Bristol North West on a Global grant for a project in Nepal. We would like to hear more about Global Grants to share with clubs within the district. Before these two events Severn Vale have a Quiz Night on Friday March 7 at Elmore Hall. Two very busy clubs over the next weeks. Details will be on the District Website landing page. many clubs arrange international speakers, invite youth exchange students and international scholars from schools and universities to club meetings, plan programs featuring former Group Study Exchange team members,arrange discussions on international Issues, present entertainment with an international cultural or artistic theme and schedule other programs with an international emphasis. Many clubs take the opportunity to launch an international community service activity or make contact with a Rotary club in another country. It is a good month to initiate a Rotary Fellowship Exchange, a 3-H project or encourage support for PolioPlus and other Rotary Foundation programs.World Understanding Month is a chance for every club to pause, plan and promote the Fourth Avenue of Service—Rotary’s continued quest for goodwill, peace and understanding among people of the world. Quite a short version of your eNewsletter this time. By the time you read this your editor will probably be in Chicago meeting with editors across the world of Rotary. I'll tell you all about it when I get back. It's then straight into RIBI Assembly though.